It was spring, 2013 in Northern Nevada. After releasing the initial version of WashoeBurn, a burst of change came quickly. Thanks to Larry‘s prodding, Washoe Air was a relatively quick changeover, moving from focusing on the narrow to the more broadly needed exposure of the underlying air quality information in addition to the location-specific “burn codes”. 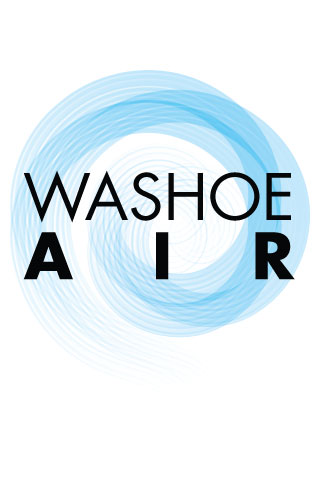 Larry is also to thank for the logo for Washoe Air, which went on to be used in several places, such as the rapidly added automated Twitter feed. For a variety of reasons, the app was designed for Apple’s devices, not Android (or Blackberry, or Windows Phone, or…). This left out a non-trivial amount of the population who still would commonly be in the dark about burn codes, changes to air quality, and the like. The quickest way to resolve this at the time was to take advantage of the real-time news nature of Twitter and do periodic updates to that as well to give non-app access to what increasingly seemed (gut-feel) to be important information for many. So here Washoe Air was, a burn code app morphed into a general air quality publishing app using data from the US EPA’s AirNow program. It had a name and logo that appropriately reflected its purpose. It had no real supporters aside from a few insiders but that didn’t matter; profit was defined as secondary to the usefulness and user experience for this app. Now all it needed was to catch fire, as it were.